Born in 1919, Wu Guangzhong also named Tu, is a native of Yixing in Jiangsu province. He was originally an engineering student, yet upon his visit to Hangzhou National Art College headed by Lin Fengmian, he was immediately fascinated by the brilliance of art and devoted his life to it. Wu graduated from the Hangzhou National Art College in 1942 and became one of the best student of Lin. He went to France in 1947 and entered the ole Nationale Sup?ieure des Beaux Arts in Paris. After his return to China in 1950, he took a series of teaching post in various academies including the Central Academy of Fine Arts in Beijing, Qinghua University and Beijing Arts School. Wu has numerous publications including Kite with Unbroken String, On Coping Styles and Searching East and West. Wu is an energetic and creative artist who excels equally in oil and ink painting. For decades he has been exploring ways of reconciling the two traditions, and in his work shows a mutual influence of Chinese and Western styles. His early works which depicted Jiangnan river houses as a major theme were highly poetic. Special emphasis was given to the mix and match of points, lines and surfaces in his composition. His outdoor landscapes are wonderfully conceived, involving selection of different vantage points as the artist seeks the subtle movements and serene presence of nature through painted forms. On August 29，Wu Guanzhong was born in Beiqu village，Zhakou township，Yixing county，Jiangsu province.His father，Wu Kuangbei，was a farmer and teacher in the village primary school. Studied in Wu's Primary School，and learned painting from Miao Zuyao. Completed his studies in Wu's Junior Primary School（1st-4th grades），entered Eshan Senior Primary school in Heqiao town，and boarded in the school. Graduated from primary school，and entered Wuxi Provincial Normal School. Completed three years' education in normal junior high school，changed to electric machinery department in the Affiliated Industry School of Zhejiang University. Got acquainted with Zhu Dequn，a student from Hangzhou Art College.Influenced by Zhu，Wu gave up on the electric machinery specialty and attempted to enter National Hangzhou Art College. Entered the preparatory course of Hangzhou Art College against his father's expectation，and learned from Li Chaoshi，Fang Ganmin，Wang Ziyun，and etc. The War of Resistance Against Japan broke out. In this winter，Lin Fengmian，the school's president，led all the teachers and students from Hangzhou Art College to leave Hangzhou by water，and arrived in the countryside of Zhuji county.Then，they changed the school's location several times，and finally arrived in Guixi，Jiangxi province. In spring，Hangzhou Art College moved from Jiangxi province to Yuanling，Hunan province. Entered the undergraduate course from the preparatory course in National Art College，learned oil painting from Chang Shuhong and Guan Liang.Meanwhile，also learned Chinese painting. In spring，passed Guiyang to arrive in Kunming with National Art College. Gave himself the pseudonym“Wu Tucha”，thereafter began to sign “Tu”on his paintings. In the beginning of the year，National Art College gave lessons in Jiyong ancient temple in Anjiang village，Yunnan province. In autumn，National Art College moved to Bishan，Sichuan province. Restricted by the lack of oil paint inside the war environment，changed to Chinese painting department，and learned from Pan Tianshou. Moved to Songlingang in Chongqing，Sichuan province，with National Art College. Changed to western painting department. Graduated from National Art College.Taught for an absent teacher in a primary school in Chongqing，then became a tutor in the architecture department in Chongqing University.After school，he audited the lessens of Chinese literature in Central University. In December，his“Still Life”participated in the 3rd National Art Exhibition in Chongqing. In spring，Wu Guanzhong Solo Exhibition was held in Shapingba Youth Palace in Chongqing. He decided to learn painting in France，and diligently studied French from Jiao Juyin，a playwright，and a French priest in a nearby catholic church. Fell in love with Zhu Biqin，a student from Chongqing Female Normal College. In summer，he was recruited for the highest total grades in all art courses during the student abroad examination organized by the education ministry. In winter，got married to Zhu Biqin in Nanjing. In July，he embarked on an American ocean liner in Shanghai to arrive in Europe.In Napoli，Italy，he took a train to go to France，and reach Paris on August 25. Studied in École nationale supérieure des Beaux-Arts，and joined in Professor J.Dupas' studio to learn painting. In the late autumn，his first son Keyu was born in Yixing. Changed to Professor J.M.Souverbie's studio. In summer，went to Italy and Switzerland，visited museums and ancient cultural relics. His works were exhibited in spring and autumn salon exhibitions in Paris. Continued his studies in Paris.In summer，went to London，UK，to learn English. In summer，embarked from Marseilles for home.Waited for an assigned job in Beijing. In autumn，introduced by Dong Xiwen，a schoolmate from Hangzhou Art College，he taught sketch in the preparatory course in Central Academy of Fine Arts in Beijing. His wife and son moved from Yixing to Beijing，and lived in a rented house in Dongsi -Wei Lane，Dongcheng district. When teaching in Central Academy of Fine Arts，he introduced western modern painting to the students，and expressed his individual art concepts. In summer，moved to the academy's dormitory in Dayabao Lane，Dongcheng district. His second son Youhong was born. Criticized in Cultural Rectification Campaign，he was condemned as the fortress of bourgeoisie's formalism，and his figure paintings were judged as distorting workers，farmers and soldiers.Changed to create landscapes for unwilling to create figure paintings according to political patterns. His third son Yiding was born. In the beginning of the year，he was transferred to the architecture department in Tsinghua University to teach sketch and watercolor painting.Moved to Tsinghua garden. Taught in the architecture department in Tsinghua University. Went to sketch in Wutai Mountain in Shanxi province and Hua Mountain in Shaanxi province. Recommended by Zhang Anzhi，Wei Tianlin，vice president of Beijing Art Normal Academy，invited him to work as a vice professor and chief of oil painting studio. Went to sketch in Shaoxing，Zhejiang province.His“Lu Xun's Hometown”participated in Socialistic Countries' Plastic Art Exhibition held in Moscow. Joined in Chinese Democracy Alliance. Went to sketch in Dayu Island in Shandong province，Jinggang Mountain and Ruijin in Jiangxi province，and etc. Went to sketch in Hongtong county in Shanxi province during vacation. Went to sketch in Hainan Island. Fine Art magazine published his sketches created in Jinggang Mountain and the article “Random Notes of Sketching Trip in Jinggang Mountain”. Beijing People's Fine Arts Publishing House published Collection of Wu Guanzhong's Landscape Paintings. Beijing Art Normal Academy was converted into Beijing Art Academy，and the oil painting department established Wu Guanzhong's Studio. In summer vacation，he went to sketch in his hometown Yixing. Organized by Chinese Fine Artists' Association，went to sketch in Tibet with Dong Xiwen and Shao Jingkun，and stayed in Tibet for 5 months.At the end of autumn and the beginning of winter，successively held sketch exhibitions in Lhasa and Beijing. Failed to move his father's house to Beijing，and Wu Kuangbei died of edema because of famine in Yixing. Fine Art magazine published“About Landscape Painting”in the February issue. Went to sketch in Fuchun River and Yandang Mountain in Zhejiang province，and created more than 60 pieces of paintings. Created“Fishing Boats on the Fuchun River”. As Beijing Art Academy was canceled，he was transferred to teach in Central Academy of Art and Design. At the beginning of the year，in the Great Hall of the People in Beijing，he created large-scale oil landscape paintings，“Jinggang Mountain”，“Spring Morning in North China”，“Spring Snow”. In August，in Jietai Temple in Beijing，created a large-scale oil painting“Green Pine Trees & Red Sun”. With teachers and students from the senior grades in Central Academy of Art and Design，he participated in the Four Cleanups Movement in Ren county，Hebei province.After half a year，he suffered from hepatitis and returned home to recover. After the Cultural Revolution broke out，he destroyed his works and all the collected foreign catalogues and books. The Red Guards from Central Academy of Art and Design searched his house，confiscated the properties，and forbad him from painting or writing. Received condemnation in Central Academy of Art and Design，studied books written by Chairman Mao，labored，and conducted self-criticism. With teachers and students from Central Academy of Art and Design，he received “re-education”in Li village，Huolu county，Hebei province，where an liberation army stationed，and labored with disease. Labored in a village to receive“re-education”. In March，arranged by the army，he directed art creation in an army oil painting class in Xingtai，Hebei province.He created quite a few landscapes in Xingtai，including “Baipo Mountain Range”. Began to create during the leisure time，often went to sketch with his manure basket，therefore his students playfully called him“manure-basket painter”.Created “Landlord's House”，“Pumpkin & Shoes”，“Sparrow”，“Wild Chrysanthemum”，“Melon Vine”，“Chinese Sorghum & Cotton”，“Maize Cobs”，etc. In winter，he was permitted to visit his family.With his wife，he went to Guiyang to visit his sick mother-in-law，passing Guilin.Created“New Bamboos in Li River”，“Mountain Village in Guilin”，“Qianling Mountain”，etc. In April，notified by his superiors，he returned to Beijing to create a huge wall painting“Ten Thousand Miles of Yangtze River”for Beijing Hotel.To prepare for the creation，went to Chongqing along Yangtze River with Huang Yongyu and others，passing Shanghai，Suzhou，Wuxi and Nanjing. Created“Early Spring in Purple Bamboo Garden”，“Irrigated Filed”. The task of creating for the hotel stopped.Created“Group of Geese in Tai Lake”，“Spring Scenery in Mountain”，“The 1970s in Shanghai”，“A Mountain City Alongside the Yangtze River”，“A Huge Harvest”. Began to create ink paintings. Went on sketch in Longxu Island and Mount Lao，Shandong province.Created“Red Chambers of Qingdao”，“Pines & Rocks of the Lao Mountains”；created“Royal Garden”，“Beijing Pine Trees”，“Sun Flower”. In spring，went to“open a school”in Jiaodong of Shandong province with students from Central Academy of Art and Design，and climbed Tai Mountain on the way back.Created“Longxu Island”，“A Seaside fisherman Village”，“White Chickens in a Nursery”，“Warm Spring in a Little Yard”，“Pine Tree's Soul”，and etc. In summer，created“Skyscraping Pines & Cypresses”，ink painting“New Bamboos besides Li River”. In December，began to create the huge oil painting“Three Gorges of Yangtze River”for China Museum of History. In February，finished the huge oil painting“Three Gorges of Yangtze River”created for China Museum of History，which is one of his representative works. In March，went to sketch in water-town Shaoxing of Zhejiang province to create for Lu Xun Museum，created 16 pieces of oil painting sketches. In October，went to sketch in Xiamen，Gulangyu，Wuyi Mountain，Jinggang Mountain，Shao Mountain，and etc，created“Forestry Station in Wuyi Mountain”，“Courtyard in Gulangyu”，“Full Spring inside Walls”，“Seedling Nursery”，“Highest Peak in Jinggang Mountain”，and etc. In March，Central Academy of Arts and Design organized Exhibition of Wu Guanzhong's Works，which was his first solo exhibition after his returning to China.During the exhibition，delivered an academic speech“The Experiences of Making Foreign Things Serve China and Making the Past Serve the Present in Painting Practice”for the teachers and students. Went to sketch in Kunming and Li River，created“Jungle at the Foot of Yulong Mountain”. Invited by Lu Xun Museum，created a huge oil painting“The Hometown of Lu Xun”. In March，joined in Beijing Oil Painting Research Association voluntarily organized by Beijing oil painters. In April，National Art Museum of China in Beijing organized Exhibition of Wu Guanzhong's Paintings.After the exhibition in Beijing，was invited to hold the exhibition in Hubei，Hunan，Zhejiang，Jiangsu，Guangdong，Guangxi，Shanxi，Liaoning，and some other provinces，meanwhile made academic lectures following the exhibitions.Created“Three Gorges of Yangtze River”for the Great Hall of the People，created“Great Wall”for Beijing Capital Airport，and went to sketch in Daba Mountain in Sichuan province. In May，published“The Beauty of Painting's Form”on Fine Art magazine. In autumn，went to Hunan to make a sketch for a huge work of Hunan embroidery for Hunan hall in the Great Hall of the People.When passing Zhangjiajie，wrote an article to praise Zhangjiajie in press，which made Zhangjiajie famous from then on. In November，was elected as the standing trustee of Chinese Artists' Association. Created“Le Mountain Buddha”，“Bamboo Shoot Woods”. In spring，took students to sketch in Luzhi of Suzhou; created ink painting“Great Wall”for Fragrant Hill Hotel.In summer，went to sketch in Group Island of Zhoushan.In autumn，went to sketch in Leigong Mountain，Jinping and Qingshui River in Guizhou. In March，published“Research about Plastic Art's Close Connection with Human Body's Beauty”in Fine Art magazine.In October，published“About Abstract Beauty”in Fine Art magazine，causing great controversy in art circles. In spring，Beijing Branch of Chinese Artists' Association hosted Exhibition of Wu Guanzhong's New Works.Went to sketch in Yixing's countryside. In summer，went to Sinkiang to give lectures and to sketch; went to sketch in Shidu of Beijing and Yixing. In winter，as the head of Chinese Artists' Delegation，visited Nigeria，Sierra Leone and Mali with Zhan Jianjun，Liu Huanzhang.Met his old friends Zhu Dequn，Xiong Bingming and Zhao Wuji when passing Paris. Created“Ancient City Relics beside Jiaohe”，“Relics in Gaochang”，“Birch Woods”，“Dessert，Pine Soul”，“Mulberry Garden”，“A Couple of Swallows”，and etc. Was promoted from vice professor to professor. In February，returned home from Africa.Went to sketch in Wuzhen and Shitang fishing port in Zhejiang province，Shanxi province，and etc.His works participated in Modern Chinese Painting Exhibition in Tokyo，Japan，and spring salon exhibition“Art of People's China”in France. The October issue of People's Literature published“Looking towards the Road to the End of the World—About My Art Life”（original title: Golden Millet Dream）.Sichuan Fine Art Publisher published the first volume of Selection of Wu Guanzhong's Traditional Chinese Paintings.Sichuan People's Publishing House published Collected Works of Seeking Everywhere. Created ink painting series“Spring Snow”，“Mending Fishing Net”，and created a huge oil painting“Jinggang Mountain”for Beijing Great Wall Theatre. Exhibition of Wu Guanzhong's Works was held in Jiangsu Art Museum. Went to sketch in Jiangsu province，Zhejiang province and Yellow Mountain in Anhui province，and participated in torch festival in Color Valley，Daliang Mountain，Sichuan province. Created ink paintings“Cypress of the Han Dynasty”，“Pine Soul”，“Lotus Pond”，“Lion Forest Garden”，and etc. In Shenyang，participated in appraisal work of oil paintings as a commissioner of appraisal in the 6th National Fine Art Exhibition. Went to sketch in Wutai Mountain of Shanxi province，Hukou of Yellow River，and Longmen Grotto of Henan province; went to sketch in Three Gorges of Yangtze River，Dazu，Le Mountain and Wu River.Created ink paintings“Roaring，Torrent”，“Setting Sun over a Long River”，“Gezhou Dam”，“A Great River Running to the East”，“Buddha”，“White Bark Pine”，and etc. Shanghai Publisher of Literature and Art published his essay collection From Different Areas; Sichuan Fine Art Publisher published the second volume of Selection of Wu Guanzhong's Traditional Chinese Paintings. In April，Chinese Artists' Association hosted Exhibition of Wu Guanzhong's New Works in National Art Museum of China，exhibiting some quite abstract works created in recent years. In April，participated in Art Symposium on Oil Painting organized by Fine Art Research Institute of China Art Research Academy and Anhui Branch of Artists' Association in Jing county，Anhui province，suggesting this meeting to be Chinese oil painters'“Jing County Uprise”in his speech. In May，was elected as the standing trustee in the 4th representative conference of Chinese Artists' Association. In summer，went to sketch in Changbai Mountain of Jilin province，Kunshan of Jiangsu province，Jiuzhaigou of Sichuan province，and etc. Sichuan Fine Art Publisher published his collected articles entitled Never-Blown-Off Kite，and the third and the fourth volumes of Selection of Wu Guanzhong's Traditional Chinese Paintings. Retired from Central Academy of Art and Design. Created“Birch Trees”，“Bamboo Forest”，“Fish in play”. Participated in the Exhibition of Contemporary Chinese Painting and its symposium in Hong Kong. Went to sketch in Wutai Mountain，Hukou of Yellow Mountain and Luliang area in Shanxi province. 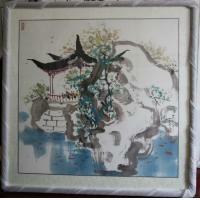 Heibei Fine Art Publisher published Wu Guanzhong's Selected Paintings. Created“Spring Mountain in Red Ink”，“Mountain”，“Waterfall”，“A Village of the Altai Mountains”，“Mountains High and Streams Eternal”，and etc. In April，went to sketch in Tiantai Mountain，Zhejiang province. In June，went to India to attend the opening ceremony of Chinese Contemporary Oil Painting Exhibition，then sketched in India. In September，went to Hong Kong to attend the opening ceremony of Wu Guanzhong's Retrospect Exhibition held in Hong Kong Arts Centre. Created“Relics in Gaochang（No.2）”，“Pines and Rocks of the Lao Mountains”，“on the Journey”. In February，went to Singapore to attend the opening ceremony of Wu Guanzhong's Painting Exhibition hosted by Singapore National Museum and Nanyang Art College，and then sketched in Singapore. In May，created a huge ink painting“Parrot”in Beijing; in June，created a huge ink painting“Peculiarities”for Beijing Hotel.Created“Qiujin's Former Residence”，“A Village in the Wuyi Mountains”，“Great Wall”，“Flower or Grass”. In January，created a huge oil painting“Snow Mountain”for Beijing VIP Hotel. In February，created a huge ink painting“Birds' Heaven”. From March to April，invited by the owner of Seibu Department Stores in Japan，went to sketch in Paris. In June，accompanied by his wife，attended the opening ceremony of Touring Exhibition of Wu Guanzhong's Works organized by Chinese Culture Foundation in San Francisco，USA，and then sketched there.Meanwhile，a large-scale catalogue Collection of Wu Guanzhong's Paintings was published. In October，went to sketch in Loess Plateau in Hequ county of Shanxi province，created “Yellow River in the Horizon”. In December，Sichuan Fine Art Publisher published Wu Guanzhong's Collected Articles. From February to March，gave lectures in Hong Kong. In May，attended the opening ceremony of Wu Guanzhong's Water Color Exhibition in Singapore and gave lectures，meanwhile a namesake catalogue was published for the occasion.In November，accompanied by his wife，went to sketch in Hong Kong to prepare for an exhibition“Hong Kong in the Eyes of Wu Guanzhong”. Foreign Languages Press in Beijing and Sichuan Fine Art Publisher jointly published a catalogue Selected Works of Wu Guanzhong in Chinese and English version. Taipei Artist's Publishing House published Wu Guanzhong's Painting Album. During this year，created more than 20 pieces of oil paintings and more than 60 pieces of ink paintings. In March，his wife Zhu Biqin became sick and was admitted to hospital，so he stopped painting temporarily. In April，Rongbaozhai published Landscapes by Wu Guanzhong. In July，received the Officer de L'Ordre des Arts et des Lettres from the Ministry of Culture of France at the France Consulate in China. In September，destroyed more than 200 pieces of oil paintings，ink paintings and watercolor paintings that he considered unsatisfactory in his own collection at home. In October，went to sketch in Taihang Mountain. Created“Daydream No.1”，“Wisteria”，“Local Accent”，“Silver Birch Woods at the Foot of Changbai Mountain”，and etc. From March 15 to May 10，visited London to attend the opening of the exhibition“Wu Guanzhong: A Twentieth-Century Chinese Painter”organized by the British Museum；meanwhile a catalogue was published.The British Broadcasting Corporation interviewed Wu and filmed a special program for the occasion.Sketched in the northern and southern parts of the UK. In September，invited by the Chinese Central Television to go to his hometown Yixing，the Wu district，Luzhi，Guangfu and Zhouzhuang，etc.for the production of the film Life Landscape. From November 17~23，visited Tokyo to attend the opening of Wu Guanzhong's Exhibition，and went to sketch in Kyushu and other places. Created“Shakespeare's Hometown”，“Complex”，“Local Accent”，“Bridge Town”，“British Village Inn”，and etc. In January，the Oriental Press published Wu Guanzhong's selected writings Looking towards the Road to the End of the World. In November，visited Paris to attend the opening of the exhibition“A Contemporary Chinese Artist：Wu Guanzhong's Recent Ink Paintings，Oil Paintings and Sketches”organized by the Musée Cernuschi，Paris. On November 30，engaged in the prosecution of Duoyun xunan，Shanghai and Wing Sing Antiques Auction House，Hong Kong for the auction of a fake painting“A Portrait of Mao Zedong-Bombing the Headquarters，One of My Big-character Posters”under his name，which encroached on his right to name and right to reputation，at Shanghai intermediate People's Court. Created“Yellow River”，“Sinking”，“Wild Grasses and Idle Flowers”，“Among the Woods”，“A Fishing Harbour in the Night”，“Spring like a Line”，and etc. In March，was appointed committee member of the Chinese People's Political Consultative Conference. In May，visited Finland，Sweden，Norway，Denmark and Belgium with the delegation of the Chinese People's Political Consultative Conference. In September，sketched during his visit in Indonesia. Created“Dessert”，“Vanishing Lane”，“Boat Group in Indonesia”，“Mountains & Rivers in Norway”，and etc. In January，published a long article“Ten Thousand Liangs of Gold Paid for the Lawsuit”on The Guangming Daily. In March，People's Fine Art Publisher published Wu Guanzhong on Art. On September 28，won the first lawsuit of fake painting in China.The accused part refused to accept the result，and appealed. In October，visited Hong Kong to attend the opening of“Xubaizhai International Symposium and Exhibitions on Twentieth-Century Chinese Painting”organized by Hong Kong Urban Council and Hong Kong Museum of Art.“Vision and Revision: Wu Guanzhong”was one of the thematic exhibitions. Created“Household in Jiangnan”，“Memory about Hometown”，“Birds in Woods”，“Red Dragonfly”，“Green Chinese Sorghum”，and etc. In February，Rongbaozhai in Beijing published Reading Shitao's Treatise on the Philosophy of Painting. In March，won the lawsuit of the fake painting“A Portrait of Mao Zedong-Bombing the Headquarters，One of My Big-character Posters”with Duoyun xunan，Shanghai and Wing Sing Antiques Auction House，Hong Kong，at Shanghai Supreme People's Court. In May，hosted International Academic Symposium of Science and Art together with Professor Tsung-Dao Lee. Created“Melon Vines”，“Memory about Jiangnan”，“Wild Vines & Bright Pearls”，“Springs & Autumns in Lotus Pond”，“Red Dragonfly”，“Dots and Lines Greeting Spring”，and etc. In May，visited Taiwan to attend the opening of Wu Guanzhong's Painting Exhibition organized by the National Museum of History and etc. In November，his article“Ink-Brush Equals Zero”was published in Chinese Culture Newspaper in Beijing. People's Literature Publishing House published Zhai Mo's Fulfilled Rainbow: A Biography of Wu Guanzhong. Created“Snow Mountain”，“Forgotten Snow”，“Setting Sun in Hua Mountain”，“Old Chongqing”，“Old House”，and etc. In August，took students to sketch in Bashang，Hebei province. In November，participated in Contemporary Chinese Landscape Oil Painting Exhibition hosted by China Oil Painting Association and etc. Created“Homeland of Balsam Pear”，“Yellow River”，“Sinking & Floating”，“Flower of Evil”，“Small Boat”，and etc. In February，People's Literature Publishing House published Voice-Over: Wu Guanzhong. In November，the exhibition“Wu Guanzhong's Art”hosted by the Cultural Bureau of the People's Republic of China was held in National Art Museum of China，meanwhile Wu Guanzhong's donation ceremony and academic symposium were held. Shanghai Wenhui Publishing House published three volumes of Collected Essays of Wu Guanzhong. Created“Predestined Relationship over a Wall”，“Unexpected Meeting”，“Willow Trees in Spring Breeze”，“A Quadrangular Yard”，and etc. In April，went to sketch in Jiangsu and Zhejiang provinces. In October，Hebei Education Publishing House published a catalogue Famous Artists of China: Wu Guanzhong. Created“Sail & Net”，“Window”，“A Long Windless Day”，“Night Navigation”，“Net of City”，and etc. In October，went to sketch in Anhui province. Created“Life”，“Double Happiness”，“Red Chamber”，“Attachment”，“Spring Breeze”，and etc. In March，was selected as Medaille des Arts et letters by Academie des Beaux-Arts de L'Institut de France. In March，attended the exhibition“Wu Guanzhong :A Retrospective”organized by the Hong Kong Museum of Art and the related activities. In April，received a cataract surgery in Beijing Tongren Hospital. In August，PLA Literature Publishing House published Wu Guanzhong Inside and Outside Paintings. In September，went to inspect the Protection Project of Wildwood in Shaanxi province. In October，visited the frontier area of Yunnan province. In January，Guangxi Fine Art Publisher published 2001 Almanac of Wu Guanzhong's Works，and the Series of Wu Guanzhong's Writings and Paintings（4 volumes）. In October，Sanlian Book Store of Life，Reading and New Recognition published View of Life: Special Collection of Wu Guanzhong's Art（4 volumes）. In January，finished the autobiography I Fail Painting. In February，a long scroll of oil painting“Yangtze River in 1974”created 30 years ago was rediscovered at home. In June，People's Literature Publishing House published I Fail Painting: Wu Guanzhong's Autobiography. The first exhibition of a world touring exhibition“Emotion & Innovation: Course of Development of Wu Guanzhong's Ink Paintings”was held in the headquarters of UNESCO in Paris.Then，this exhibition moved to National Art Museum of China，Beijing. In the middle of June，became sick and was admitted into hospital in Beijing. Special Exhibition of Wu Guanzhong's long scroll painting“Yangtze River in 1974”was held in the China Millennium Monument，and a namesake catalogue was published for this occasion. In August，recovered his health and left hospital. In January，Sanlian Bookstore（Hong Kong）published I Fail Painting: Wu Guanzhong's Autobiography. People's Literature Publishing House published a collection of writings Thread of Ideas in Writing Out of Painting. At the end of May，became sick and was admitted into hospital in Beijing. In the middle of June，recovered and left hospital. In September，Shanghai Art Museum organized Retrospect Exhibition of Wu Guanzhong's Art，meanwhile published a large-scale catalogue.Went to Shanghai to attend the opening ceremony，and donated 6 pieces of selected works to Shanghai Art Museum. During this year，created more than 50 pieces of ink paintings，including“Evening Fragrance”，“Own Mountains & Rivers”，“Setting Sun in a Lonely Peak”，“Black Dragonfly”，and etc; wrote more than 30 pieces of calligraphy，that is，the series of Chinese Characters' Springs & Autumns. In August，voluntarily donated his classic representative oil painting long scroll “Yangtze River in 1974”，ink painting“Megranate”and“Riverside Village to Culture Ministry”，which were permanently collected in Palace Museum. On August 27，the voluntary donation ceremony of Wu Guanzhong's“Yangtze River in 1974”and etc.and the opening ceremony of Wu Guanzhong's donated works through all these years were held in the Taihemen Square in Palace Museum.This event was hosted by the Culture Ministry of the People's Republic of China.Meanwhile，an international academic symposium was held，and a large-scale catalogue was published. In December，the Chinese University of Hong Kong granted an honorary degree of Doctor of Letters to Wu Guanzhong. In February，the compilation and publication of the 7th volume of Wu Guanzhong's Writings started，taking in about 1.5 million words of Wu Guanzhong's academic ideological theories，literary essays and notes. On August 31，Hunan Fine Arts Publishing House published Wu Guanzhong's Collected Edition，the important cultural publication project of the national 11th Five-year-project，and the new book's launching ceremony and Wu Guanzhong's art symposium were held in Beijing.Wu Guanzhong's Collected Edition is divided into 9 volumes，including 8 volumes of paintings（2048 pieces of paintings）and 1 volume of writings. On October 15，“Vicissitudes in Painting: Wu Guanzhong's Art & His Art Symposium”was held in China Academy of Art，Hangzhou. Created almost 50 pieces of colored ink paintings，“Fallen Flowers”，“Autumn Sounds”，“Old Tree & Dusk Crow”，and etc；created almost 20 pieces of calligraphy，the series of Chinese characters' springs and autumns—“Kua Fu”，“Tree's Growth Rings”，Footprints，and etc. In March，Essay Collection of Wu Guanzhong（in seven volumes）was published by Unity Press. March to May，“Wu Guanzhong in 798-Exhibition of Wu Guanzhong's New Works in 2007”was held.“Wu Guanzhong in Chengdu-Exhibition of Wu Guanzhong's New Works in 2007”was held in Sichuan Provincial Museum.“Wu Guanzhong in Chongqing-Exhibition of Wu Guanzhong's New Works in 2007”was held in Chongqing Art Museum.“Wu Guanzhong in Shanghai-Exhibition of Wu Guanzhong's New Works in 2007”was held in Wu Jiao Chang 800 Art Space in Shanghai.